>If you ask me in November what my favorite holiday is, I’ll probably say Thanksgiving. Ask me again in December and I’ll probably say Christmas. And if you ask me right now, I’ll say Halloween. What can I say? I just like holidays and all of the festive things that go along with them. 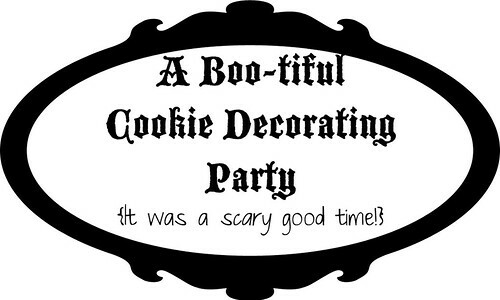 Right now black cats, ghosts, zombies, and sweet treats are putting me in the holiday spirit. So when Foodbuzz put out the call for fall-inspired ideas for this month’s 24×24*, a lightbulb went off. 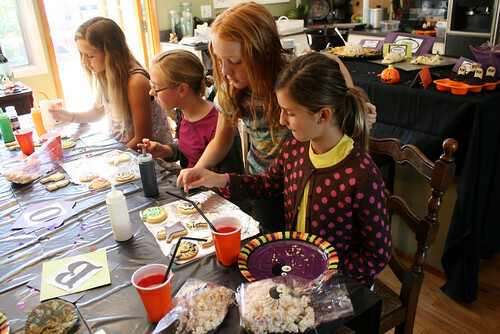 My idea was to host a cookie decorating party – for kids. 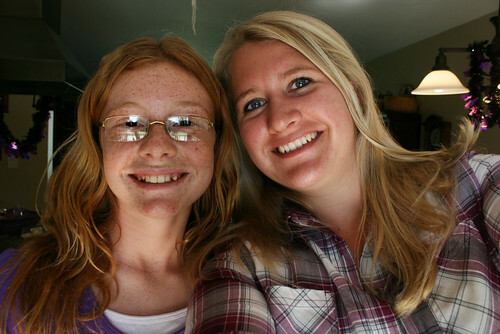 The girls that I watch were each allowed to invite a few friends and as soon as the invitations were delivered we started the party planning. Coming up with the menu was pretty fun. I had about a million ideas for fun gross variations of food. But at the end of the day I had to keep in mind my audience so I needed to keep it simple. Oh, and I am apparently no good at making deviled eggs, so at the last minute I had to give up my dreams of creepy eyeballs. First up was the main course. 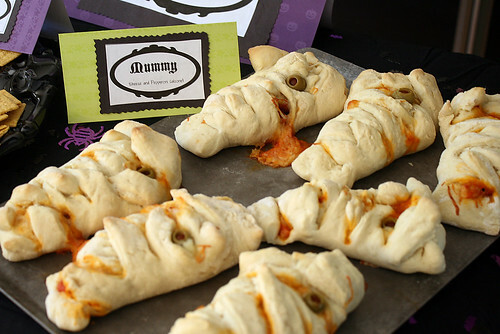 Mummy calzones. 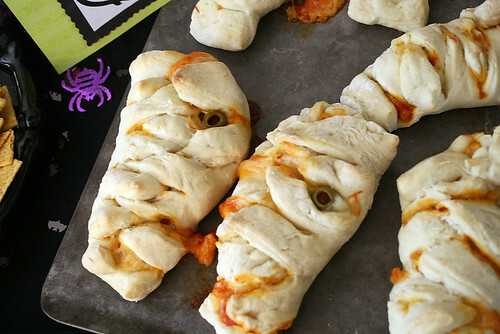 Each one was filled with cheese and pepperoni and then finished with a green olive eye. 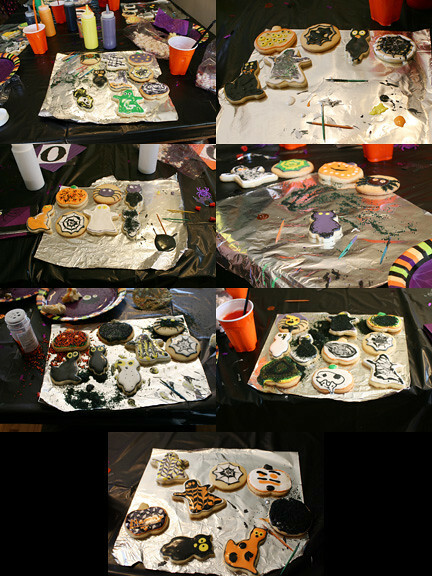 Most of the girls didn’t eat the “eye” but they loved the rest of it! 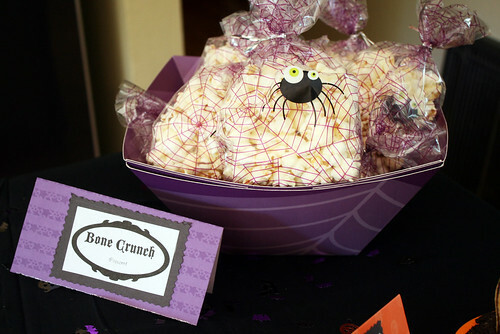 Next up was the “Bone Crunch” or popcorn. Not homemade, but I knew the girls would like something simple to munch on while they worked their cookie magic. 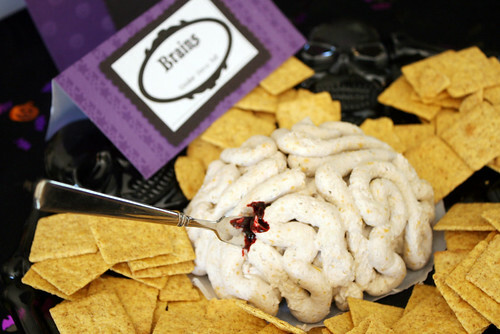 Despite the fact that some of the girls were a little afraid of eating the brain, it was a big hit! Everyone that tried it loved the flavor and EVERYONE loved the way it looked. 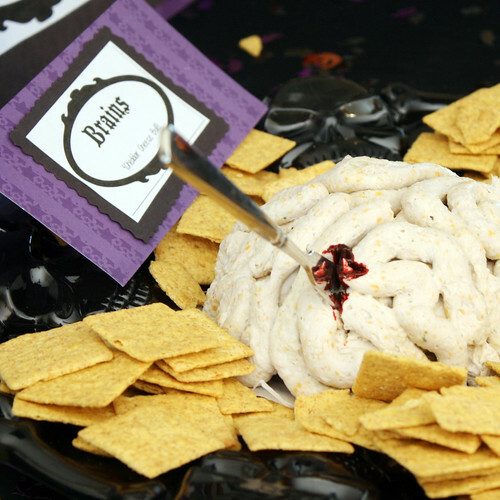 The “brain” is just a cheddar cheese and ranch cheese ball that I piped into the shape of a brain. 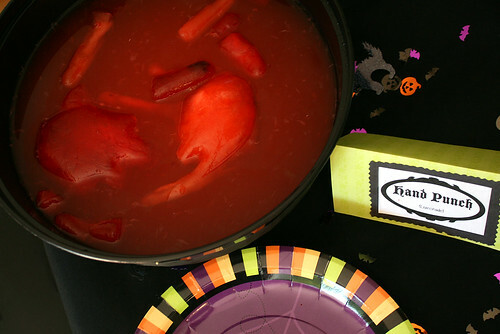 *recipe to be shared on Halloween day!! 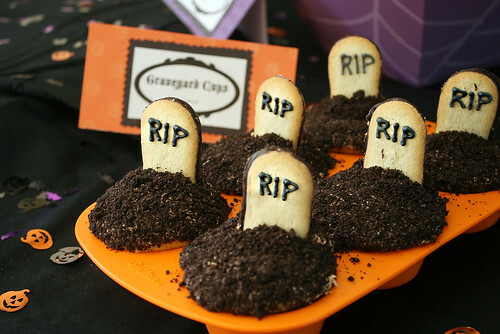 For dessert I made “Graveyard Cups”. Super simple but a pretty fun effect. 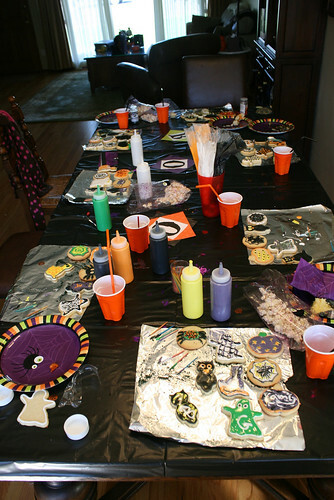 Just yellow cupcakes, and frosting, with crushed Oreos for dirt and a Milano cookie for a tombstone. To drink I once again kept it simple with a jazzed up lemonade. The night before I filled 2 rubber gloves with water and red food coloring, then I tied them up and put them in the freezer. Right before the party started I cut the glove away from the hand shaped ice and added it to the bowl of lemonade. Two things to note about this: First the red food coloring dyed the heck out of my hands as I was cutting away the glove. Maybe wearing gloves while cutting the glove would be a good idea. Second, I wanted a “mangled hand” effect so I froze it with some folds and that made the fingers weak. As soon as the glove was cut away the fingers fell off. Still fun though. 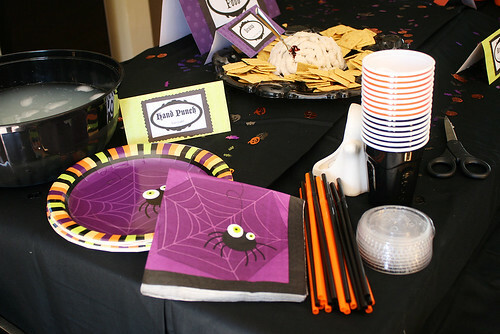 I set the mood with a black and purple spider theme and Halloween music playing in the background. 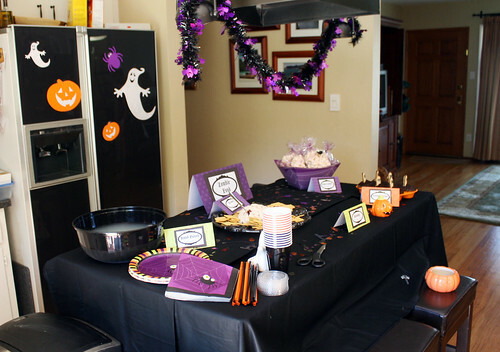 I also made Halloween themed signs with each spooky food name (and what it really was below in parenthesis). Finally, the main attraction! The cookies!!! 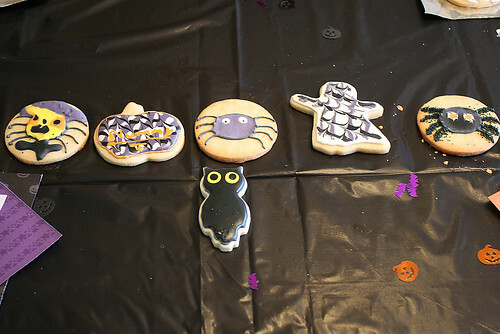 I made 5 different shapes; cats, owls, ghosts, pumpkins and circles for spiderwebs/spiders. 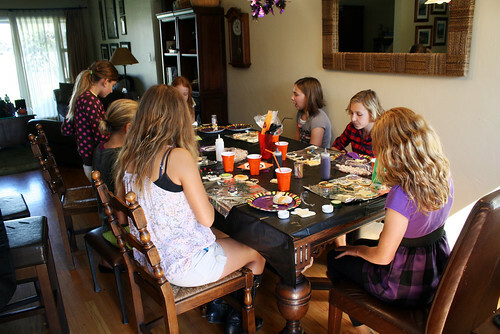 In another post I’ll be sharing how I planned and spread out the work, but for now how about some pictures of the girls working on their masterpieces? It’s fun to see how creative kids get. Purple pumpkin – of course! Pirate spider – you bet! Polka dotted cat – well yeah! I asked each girl to pick their favorite creation and these are the winners! I think I have found the last Cinnamon Roll recipe I will ever need to try. I’ve been searching for a long time and I’ve tried several. In fact I posted a recipe on this blog not too long ago. But this recipe is exceptional. The dough was an absolute dream, smooth, sturdy, and elastic. I was worried at first because the dough seemed sticky, but I’m quickly learning that usually when I think a dough is too sticky to start it’s perfect after a good long first rise. A long rise may seem daunting, but think of all things you can do during that time. While waiting for this particular batch to rise I went shopping and had a slice of pizza at my new favorite pizza place, Hoboken (if I’m not going to make my own pizza at home, this is where I want to go!!). See how productive that time can be? The other upside of this recipe is that it can be made ahead of time. I made these on Wednesday evening and froze them, Saturday night I set them out on the counter to defrost and rise. 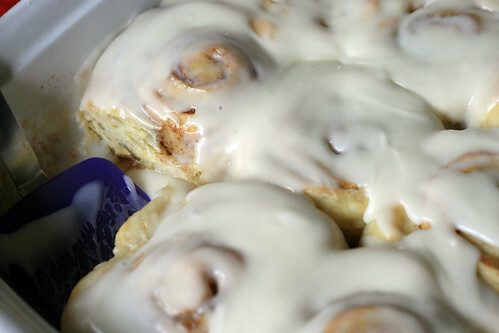 Makes me want to keep a batch in my freezer at all times, just for the those days when I need a cinnamon roll. But the best part about these rolls is the final product. The roll itself is as close to perfect as the world will allow you to get. Texture, flavor, sweet to spicy ratio, it all gets a 10 in my book. Disclaimer – I’ve never followed a strict recipe when it comes to cream cheese frosting. I start with cream cheese and butter and I add sugar and other flavors to match whatever I am making the frosting for. Sometimes I add brown sugar sometimes I don’t. For these rolls this is flavor combination I came up with and I thought it went perfectly with the rolls. I taste along the way and work until I like the flavor and consistency. Please use this ingredient list as a guide and create your own perfect frosting. In a large liquid measuring cup, whisk together the warmed buttermilk and butter. In the bowl of a standing mixer (fitted with a dough hook), combine 4 cups of flour, sugar, yeast and salt. With the mixer still running on low speed, add the buttermilk mixture and eggs. Run for 2 minutes until well combined, then increase the speed to medium and allow to knead for 10-15 minutes. If after a few minutes the dough continues to stick to the sides of the bowl add more flour, 1/4 cup at a time, just until it stops sticking. The dough will still feel slightly sticky to the touch. Remove the dough from the bowl and set aside on a lightly floured surface. Wipe out, then spray the mixing bowl with cooking spray, or rub lightly with oil, return the dough to the bowl and cover with plastic wrap. Allow to rise for 2 to 2 1/2 hours in a draft free warm place (I turn the light on in my oven and keep it in there with the door closed). When the dough has doubled in size remove from the bowl and place on a clean floured surface. Knead with hands for 2-3 minutes and then allow to rest for 2 minutes (during this short rest combine the brown sugar and cinnamon in a bowl). After the short rest shape the dough into a rectangle then roll out to approximately 16 inches by 12 inches. Spread the softened butter on the dough leaving 1/2 inch border all around. Sprinkle the brown sugar mixture over the butter and use hands to lightly press the sugar into the butter. Beginning with the edge closest to you, roll the dough into a tight log. Once rolled, even out the log by pulling gently and patting in the edges. Prepare a 9×13 baking dish by placing a sheet of fitted parchment paper in the bottom of dish and spraying with non-stick cooking spray. Place rolls in pan, cover with plastic wrap and allow to rise for 1 hour. This is also the point where you can freeze the rolls. Just be sure to cover tightly with plastic wrap and foil. Bake at 350 degrees for 22-25 minutes, until the rolls are lightly golden on top and cooked through but not overly browned. For the frosting, beat together the cream cheese, butter, and buttermilk. Starting with a slow spead, add the brown sugar, confectioners sugar, and salt, and beat until well combined. Stir in the vanilla. 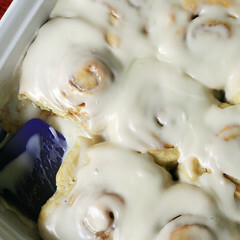 Add the frosting to the rolls while they are still warm so the gooey goodness starts to absorb into the rolls. Dah dah dah dah… It’s Elmo Time!! About a month ago a friend told me that she was throwing an Elmo themed birthday party for her sons second birthday. I have seen a few Cookie Monster cupcakes and Elmo cupcakes on various blogs in the past and I was always wishing that I had a good excuse to make them. This party was just the excuse I was looking for. So I jumped on the opportunity and offered to make the cake/cupcakes. They wound up being a huge hit and the birthday boy was definitely loving the Elmo theme. Most of the blogs that I have seen have used frosting to make the eyes and the nose but I wanted to do something different. I also knew that I would need to spread the work out over a few days and using all frosting wouldn’t work for that. So I decided I would make the eyes and nose out of Wilton candy melts. A week before the party I did a test run on my idea for decorating the cupcakes and I was so excited when it worked. The week of the party I spread the work out over three days. On Wednesday I baked the cakes and cupcakes and then covered them will saran wrap and froze them. Thursday night I made the eyes and nose. Friday I took the cupcakes out of the freezer in the morning and then in the afternoon I did all of the decorating except for the mouth (didn’t want the gel icing to spread/melt). Saturday all I had to do was put the mouths on the cupcakes and get them safely to the party. I do think that you could do all of this work in one day. It would take several hours but it is doable. I am listing step by step instructions with some pictures below! Melt the candy melts and chocolate chips in squeeze bottles by filling a bowl with hot (but not boiling) water and placing the squeeze bottles in the water. I kept the bowl next to my work station so when I wasn’t using a bottle it was staying warm. Replace the water as necessary and keep paper towels by your side to dry of bottles as needed. 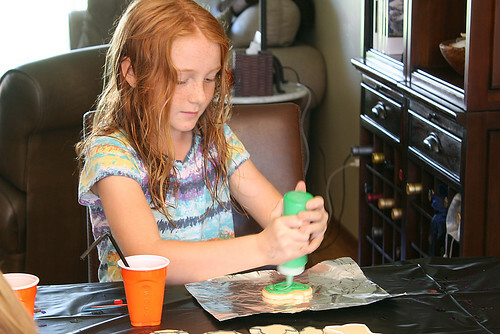 Print a picture of Elmo and place the picture under a sheet of parchment paper on top of a cookie sheet. Start by outlining the eyes in white, leaving a space for the chocolate eye. Fill in the whites and use a toothpick with small, light circular motions to smooth. Fill in the spot for the chocolate by squeezing a small amount of chocolate into the space. Then wet your fingertip and lightly press down on the chocolate to fill in the space and smooth it out. Outline the nose with orange. Fill using the same circular motions with a toothpick. Move the template to a new spot on the parchment paper and repeat until you have all of the eyes and noses that you need, plus a few extra just in case. 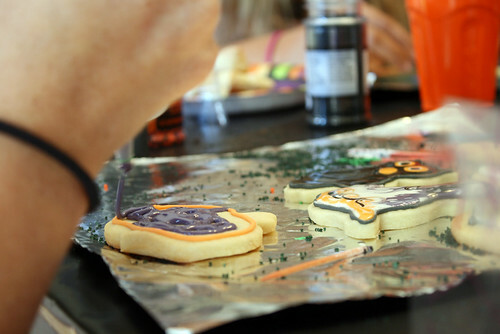 When you finish making all of the eyes and noses put the cookie sheet in the freezer to set the candy. Outline the edges of the top of a cupcake by holding the piping bag perpendicular to the cupcake. Lightly squeeze the bag and use a small down then up motion to make a star. Once the top of the cupcake is outlined fill in the middle using the same motions, be sure to make the stars close together and not to leave empty spaces. After the cupcake is frosted, place candy eyes on the cupcake letting them hang over the edge about 1/2 inch. 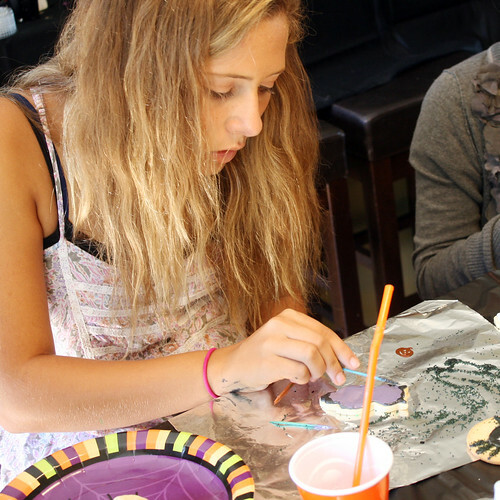 Using the black decorating gel, draw a mouth below the eyes and nose. If you do not have a piping bag you could simply frost the cupcakes using a spatula and then put the eyes and nose on. It wouldn’t have the textured look but it would have the same overall feel. Make sure the eyes and nose are fully set before trying to transport them to the cupcakes. If you are pressed for time just use a boxed cake mix and store bought icing. 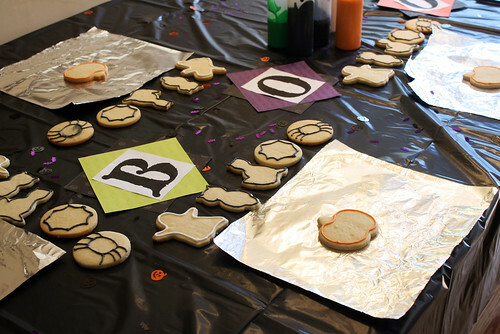 Wait as long as you can to use the decorating gel because it will eventually start to run/spread. I hope these directions help, but if anything is unclear feel free to leave a comment or email me (orangekitchencooking @ gmail.com). I will try to clarify anything that doesn’t make sense!